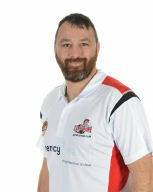 Paul joined Leigh midway through the 2016 season after finishing his commitments with Doncaster Knights RUFC where he had been engaged as skills and backs coach since 2013. He played with distinction for Hull FC, Hull Kingston Rovers and Wakefield Trinity Wildcats, clocking up 280 Super League appearances in 12 seasons in the top flight. He scored the match-winning converted try in Hull FC’s dramatic 25-24 Challenge Cup Final victory over Leeds at Cardiff in 2005. In his first full season as player-coach with Doncaster in 2014 he was chosen as Kingstone Press Championship Coach of the Year. He finished his distinguished playing career with a short stint at Featherstone Rovers. In September 2016 Paul unveiled his autobiography ‘Judas’ written in conjunction with Talk Sport broadcaster Adrian Durham.